The Orb of Insight is here! Visual Spoiler from WOTC is up. Our first spoiled card is a rare and features the new Level Up Mechanic. 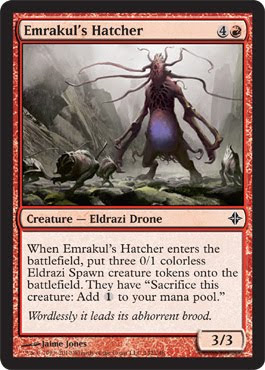 Rise of the Eldrazi is a set where, I think, even older, familiar players are going to do a serious double take. Especially with this kind of card, where the formatting is utterly different from anything we've seen. Clearly someone is taking liberties with established card frames over there in Wizards. Let me familiarize you with the Level Up mechanic and how it works! All creatures start at Level 0 - because that is the number of Level counters they start with. Level counters can only be added by paying for a Level Up, the cost of which is written right on the card. 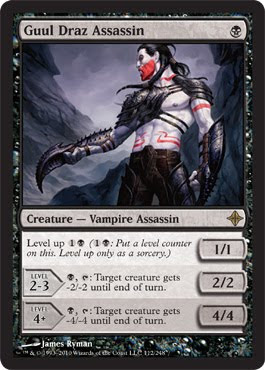 So for example, Guul Draz Vampire starts as a Level 0 1/1 when you play him. If you pay 1B twice at any time when you can play sorceries, he becomes Level 2, where he gains the -2/-2 ability and becomes 2/2. Level him up two more times and he becomes a 4/4 that can give -4/-4. Leveling him up above Level 4 is mostly pointless. This is his final "evolution" - in Pokemon terms. Turn one, he's a 1/1. By turn 3, he can kill something. By turn 5, he's a big dude that can kill most things. But, the wise player wouldn't spend all their turns leveling him up. It's more likely he will sit there until you can slowly sink the mana into him. Even at Level 2-3, this guy is a powerhouse in Limited. And meanwhile, having the threat of him on the board is enough to change the way your opponent makes decisions. Paying 2 mana twice is not too huge of an investment, as long as you prioritize spells and board position. In Constructed, it might see play. Although I have to admit, the creatures in our Constructed environment have all gotten so overwhelmingly good that it's hard to compete with what we have already. This one might be too slow. In block however, it could do very well. Red guys that give you three tokens that make mana? Huh? Well, that's how it is. So far, the two "Spawners" both have costed 5 mana. 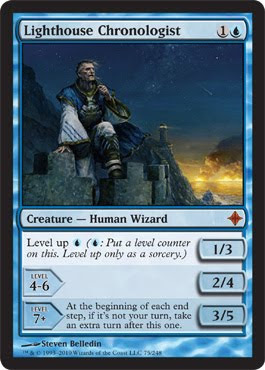 But they give you multiple tokens that make mana, so it jumps you from 5-6 mana to 7-9 on turn 6, which seems like it should cast the Eldrazi with decent reliability. You might have to wait another turn for a land drop. Man this format just seems slowww. At least relative to Zendikar. I guess that isn't saying much. Totem Armors! Another white one, though. According to the Orb, there are 11 Totem Armors in the set. I like enchantments that pump AND give abilities. I'm a fan. Constructed playable? Uh I don't think so. Yay, a bear! I like white bears; what can I say. Especially ones that become better and better as the game goes on. But MAN it sure takes forever to level this thing up all the way. Rise of Eldrazi seems so slow on some levels. 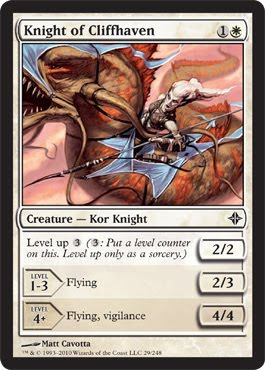 But I look at this card as more: a 2-mana 2/2 that you can kick at any time to get a 2/3 flier. Which is excellent no matter how I look at it. I see myself grabbing lots of these in draft. 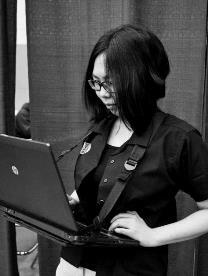 Unless everyone has to conform to a "stall until I drop a 10/10" strategy. Which... meh? So far, not enough information. 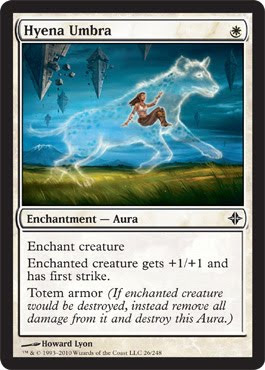 In EDH or multiplayer, if this ever goes off, uhhh. It might get the banhammer in casual circles. What happens is, you get an extra turn in between everyone else's turn. Which is fairly crazy. Fun. More ways to stall. This thing is really good at what it does. I get the foreboding feeling that ROE draft format will be all about the blocking. This card is nice, though. It's a pretty beefy mana accelerator. So it'll probably be around to accelerate out your Eldrazi spells. If you read the Mechanics page of the ROE minipage, you'll know that Defender is actually a subtheme in ROE. (I just found this out now.) In that case, there's no doubt in my mind that this format was designed to be really slow. Will aggressive strategies be viable at all? Only time will tell. 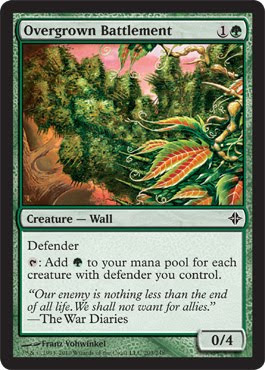 What's good about most defenders is that they usually can't block evasive creatures; so I suspect that kind of strategy could be good enought to balance how slow the format seems to be. Eldrazi at common! This Eldrazi is slightly cheaper and slightly smaller than its brethren. It also has "just" annihilator 2. Which is still fairly powerful. But if you have the option of playing out a stronger Eldrazi, you probably will want to do that. The fact that is also has the "drawback" of attacking each turn means something. 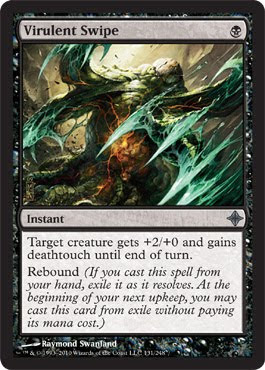 It means it can't help block and destroy other scary Eldrazi. Even though it seems somewhat counterintuitive that this thing should ever block. Lastly, we have our Rebound example. Clearly a card with Limited in mind. It makes your big defending walls actually lethal once or twice. I'm not too excited about this card in general, though. Both of the Rebound spells we've seen are just lame, Limited-only pump spells. This thing can kill creatures, but at the risk of interacting in combat and only pumping power. Seems good on a first striker I guess. No doubt, one way to try to get rid of the Eldrazi monsters - but you're already sac'ing permanents to the thing, and now you want to waste more cards getting rid of it? Presumably there will just be better answers in the set we are not aware of. I, for one, am disappointed they didn't spoil any colorless spells yet. But I am in no hurry. Like this set, I am fine with taking things slow.